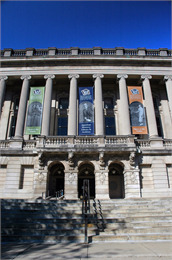 A view of the front of the Wisconsin Historical Society's headquarters building on the University of Wisconsin-Madison campus. The Division of Administrative Services provides a wide range of day-to-day support and long-range planning for the Wisconsin Historical Society including its divisions, the Director's Office, the management team and over 130 permanent and 320 limited-term employees. The Division also assists in the management and maintenance of the Society’s 247 buildings located throughout the state.